Argos has established themselves as the leading catalogue retailer in the UK. Serving over 130 million customers each year, through their 7000 stores or on the internet, they sell all kinds of goods and items. Their childcare section of their catalogue is growing and now includes changing tables. Changing tables make changing the nappy of a baby more comfortable and practical. Argos' changing tables are all flawlessly designed, and incorporate a stylish element which makes them look aesthetically pleasing inside the house. The first unit doubles up as a changing table and a bath for the infant. It is made of wood and painted white, and has three levels with an open front. On the top level there is a bath, on top of which a changing mat can be placed. The bath is therefore hidden from view, and has a secret drainage system. The top level is also surrounded by compartments to keep nappies and other items. On the bottom two levels there are further compartments with a space at the bottom to put larger objects. The changing table also has wheels so it can be moved from bedroom to bathroom, and the wheels can be locked for added safety. The other two units are designed in the same style, with the same three levels and compartments, except they do not have a hidden bath. There are two other changing tables which Argos sells. These are the Mamas and Papas Nuvola Changing Unit with Bath and the Baby Dresser Changing Unit, which has a pine finish. The first unit has an open front with three levels and is at a height which requires no bending. On the top level there is a space to put a changing mat, otherwise it acts as a bath and has a drainage system out of view. Alongside the top level are a series of compartments which can store nappies and toys. Underneath the top level are a further two levels which can hold larger items such as towels. The unit also has wheels so it can be moved around with ease. It is very safe, designed so the baby cannot fall off and the different levels aren't attached so can be removed. The last unit is a simple three-levelled structure which is sturdy enough to hold an infant weighing up to 15 kg. The two shelves are spacious enough to hold all manner of objects, while a changing mat can fit nicely into the top level. Argos changing tables are very reasonably priced. The cheapest is the Baby Dresser Changing Unit is priced at £49.99, while the Cosatto Easi Peasi Splish Splash Baby Changing Unit is the most expensive, costing £101.99. 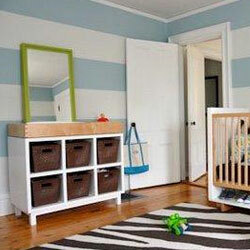 Each changing table must be delivered to the home and assembled by the customer.